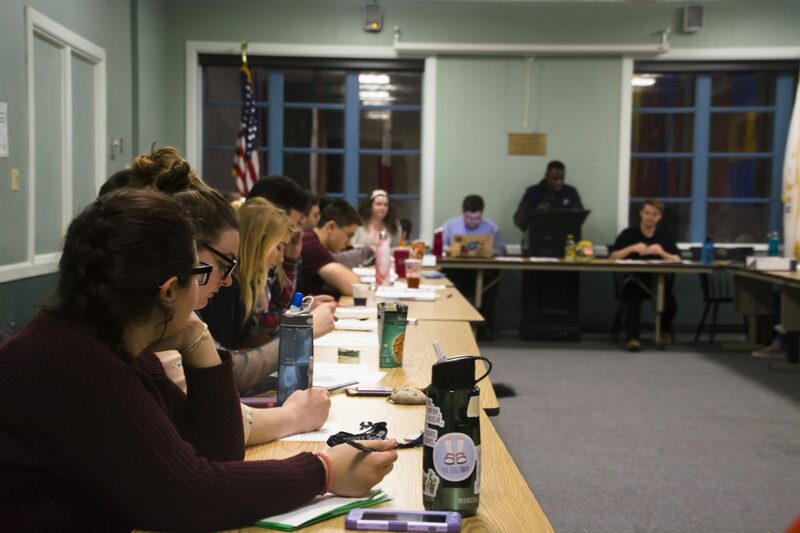 Photo by Autumn Walter |CIGAR| Wednesday night Student Senate spent over an hour discussing the presidential disqualification ticket. Student Senate voted on Wednesday, Feb. 28 not to disqualify the presidential ticket of Adriana Wilding and Abdulwhab Alquirtas. The vote was 11 in the affirmative, 14 in the negative and six abstaining. Wilding stated that she was concerned that the vote wasn’t going to go in her favor and was unsure about how the senate was going to vote. During the senate meeting the bill, SS-17/88-44 recommendation for the appeal of the elections committee ruling on the disqualification status of the presidential/vice-presidential ticket of Adriana Wilding and Abdulwhab Alquirtas, and evidence put forth was discussed in length by all in attendance. There was a lot of back and forth between the senate members about the legitimacy of the evidence, the bylaws regarding elections and the bylaws of the Director of Communications, the position that Wilding holds. The evidence all had reasoning behind it as to why it was put forward. The Facebook post editing was a conflict of interest for Wilding. As DOC, she is one of two who can moderate and post on the Student Senate Facebook page. However, during elections it is a conflict of interest for Wilding to edit posts pertaining to the elections, which did occur. The post was one where a generated grouping of photos which placed a larger picture of another ticket front and center. “It’s within my bylaws and just to make it easier on all the tickets as a whole to ensure fairness, I thought that it was within my bylaws to remove the three photos, the three campaign photos, from the post and leave up the debate flyer,” Wilding said about her removal of the post. “When you run a campaign you can only make promises for yourself, you can’t make promises for other people and what [was] just read multiple times that was making promises for other people,” Samantha King, current finance chair and candidate for the presidential seat, said during the meeting. The record from the debate, sections of which were played during the executive meeting, referenced specific times when Wilding misspoke saying she was the president of the Student Entertainment Committee, while actually being the president of the VIP subcommittee. Also, twice throughout the debate, Wilding mentioned she speaks on behalf of the student body when no one can speak for the student body as a whole, not even the Senate President who speaks on behalf of the senate. Outside of the voting booths, where it is against senate bylaws to discuss tickets or the election, it was overheard by the President of the Senate that four people were discussing that they would have to vote for Wilding and Alquirtas if they wanted money for their organization. Additionally, the screenshot of the group chat led some committee members to believe the people in the chat were under false impressions that they would be guaranteed funding if they voted for Wilding. 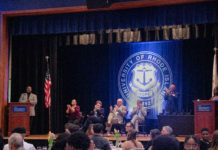 “I find it hard to believe that there is no connection between what was said in that chat and how I understand it, the impression that organizations are receiving,” Zachary Taylor, chief information officer for student senate, said. The Executive Committee voted to send the bill to the senate floor with the recommendation to keep the disqualification in place with four votes in the affirmative, two in the negative and five abstaining from the vote. All evidence was made available to the general senate before the vote took place. Wilding and Alquirtas will be running against Samantha King and Kelly Watka during the main elections next Wednesday and Thursday, 9 a.m. to 5 p.m. at the main entrance of the Memorial Union.